Tired of losing your dessert to the kids? Don't worry. We have exactly what you need with this easy strawberry dessert recipe that includes boozy whipped cream and maybe even some rum chocolate dipping sauce. You'll never have to share again. Strawberries and whipped cream are the perfect go-to dessert on hot summer days. The trouble is, the kids devour them before you even have a chance to sit down. Solve this problem by adding a bit of booze to the mix. From vodka in the whipped cream to rum in the dipping chocolate, the kids won't be allowed to eat them and you'll be satisfied with every bite. What's really great about this strawberry dessert recipe is you can make them in different ways. Use chocolate vodka for some of the whipped cream and vanilla vodka for the rest. Dip some whipped cream berries in rum chocolate sauce and eat the rest plain. Or you could even skip the boozy whipped cream and just enjoy rum chocolate-dipped strawberries. The possibilities are endless! Wash strawberries, pat dry and remove the tops. With a paring knife, cut out the center of the strawberries and discard. Set strawberries aside. In a mixing bowl, whip the cream until stiff peaks form. Be careful not to over whip the cream as it will become lumpy. Beat in the vodka and powdered sugar to taste. 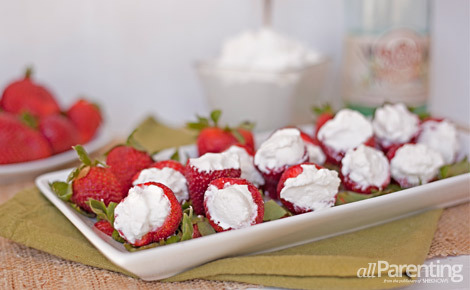 Fill the strawberries with the boozy whipped cream and refrigerate. Melt the chocolate in a double boiler, stirring constantly. 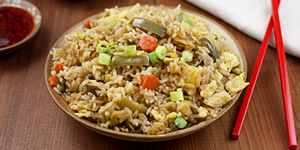 If you don't have a double boiler, simmer 2 to 3 inches of water in a saucepan. Then place a heat-proof bowl in the water and stir constantly to melt the chocolate. Alternatively, you can melt the chocolate in the microwave. Place the chocolate in a microwave safe bowl and microwave at 50 percent power for 30 seconds at a time. Stir after each 30 second interval until chocolate is thoroughly melted. Once chocolate is melted, add the dark rum and stir to combine. 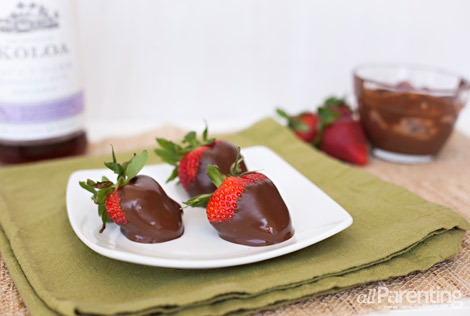 Dip the whipped cream-filled strawberries in the rum chocolate dipping sauce. Place chocolate-dipped berries on parchment paper to cool. Once cooled, move strawberries to a serving platter and enjoy.